Equipment and optional extras | What Car? The engine starter is still between the front seats, but it's now a push-button, which means the key no longer juts untidily out of the ignition barrel. This is a standard feature alongside an electronic parking brake, dual-zone climate control, six-way adjustable front seats, cruise control and a nine-speaker stereo to which you can attach an MP3 player. It's controllable from buttons on the steering wheel, too. In the boot there's a U-shaped track in the floor and a telescopic, flexible divider that helps keep cargo in place. 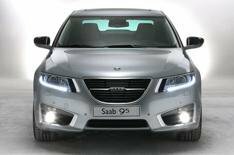 To back up the claim that this is 'the most technically advanced Saab ever', you'll be able to load the car up with plenty of 21st-century options. There's sat-nav with bird's-eye view, 11-speaker Harman-Kardon hi-fi, 10-gig built-in hard drive, twin-screen rear entertainment system, Bluetooth and SIM port, 'smart beam' headlamps, adaptive cruise control and parking guidance.